Hierarchy is not the enemy. Complex systems require differentiating the power and size of the different elements. This piece is neither a defense nor another attack on hierarchies. The solution to overcoming a command-and-control mentality is not necessarily to blow up a company’s structure into pieces. Both the natural living world and social institutions rely on hierarchies. According to the authors of Hierarchy in Natural and Social Sciences, it’s not always the end product of intentional design. Sometimes, hierarchy results from random processes or is the result of ensuring optimal circulation of energy for information. The problem is not hierarchies but a rigid approach — developing fluid leadership is a more effective way to evolve your organization. Birds have a structured and well-designed airborne hierarchy. Researchers have found that a flock of birds mimic every movement from its leader — the one flying at the front commands the rest. However, the leadership role changes several times throughout one flight. Most people believe physical reasons drive that — the front position is typically burdened with forging through strong air currents. Indeed, leading is exhausting. But there’s a more powerful reason for this fluid approach to hierarchy. By strapping tiny GPS onto the birds, scientists discovered that this adaptive approach is not just driven by reciprocal altruism every bird has bigger chances of survival if they guide the group from time to time, rather than constantly submitting to one leader. That’s why even ‘low-ranking’ birds get a chance to command. If any gets lost or something happens to the leader, the ‘organization’ can adapt and continue its mission. 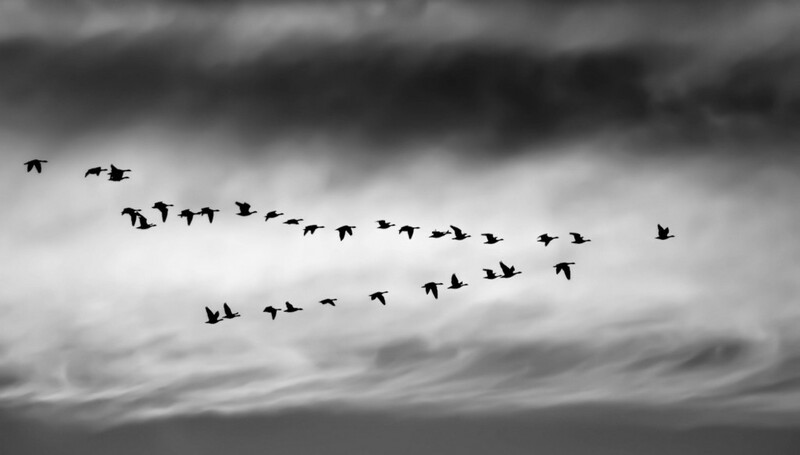 Before you continue reading, reflect: How does your company fly? I’ve written many pieces on this topic before and have observed the responses create a dichotomy. Consultants want to get rid of all structures. The defenders of the ‘old way’ fear distribution of power will drive anarchy. We need a more balanced approach. Last week, I gave a talk at a large telco on fluid leadership. Considering the reactions mentioned above, I decided to start by stating what democratization of leadership is NOT. It’s not a Pollyanna approach (“we are all leaders”) neither one where everyone has the same vote. It’s not about letting go of authority and seeding anarchy. Simply put, leadership must rotate not just to prevent exhaustion, but also to liberate people’s potential. Leadership is not a title, but a mindset — leading is a role that should be played by everyone when needed. People are the sensors of an organization. An unpredictable and uncertain world requires that companies unleash everyone’s ability to identify and bring in new ways of working or opportunities. Leading is about seeing and doing something about it. Most people miss seeing opportunities for both development and growth. However, observing is not enough — leadership requires to act upon. To stand up and make things happen. Not everyone is meant to lead the flock (or to run a company, for that purpose), but they can drive change within their area. Organizations have the responsibility to unleash the leadership gene within their teams. Delegation is not just about assigning tasks or projects but delegating authority. People need freedom to make decisions, not just to own a portion of the work. If you want your team to ‘step up,’ you must let go of the leader position first. Empty the leadership cup so others can fill the void. Fluidity is how everyone can become a leader. They are authority positions, not leadership ones. People don’t need a title to lead. Self-awareness is the meta-skill of the 21st Century. Leadership begins with leading oneself. If you don’t know yourself, how can you lead the flock? Great leaders spend time self-reflecting and understanding not just what’s evident, but their blindspots — they uncover what’s hidden. Teams that are more self-aware are more collaborative, make better decisions, and solve conflict more easily. Self-awareness has become a critical part of talent development. Leaders are not meant to have followers — that’s a passive role. You want to excite people to follow something bigger than yourself. Great leaders don’t need to build a following; they spend their energy and passion aligning people around the mission. Ignite internal desire. How can you inspire people to want to do something? Embracing vulnerability is one of the top challenges for those in power positions. I see this all the time — CEOs are great at noticing others’ flaws but have a hard time acknowledging their own. It’s time to let go not just of authority, but also of the perfect leader paradigm. Lead with questions, as I explained here. You don’t need to have all the answers. Not only it’s impossible –considering how fast the world is changing — but people appreciate more the solutions they helped create. Curiosity moves organizations from the comfort zone to the discovery zone. People are autonomous — they don’t need to be motivated by you. True motivation is internal — it’s driven by everyone’s need to manage their own decisions, work on purpose-driven missions, and master their skills. Even though it’s counterintuitive, autonomous teams are more accountable. If you have formal authority, it’s your responsibility to create the right conditions for people to thrive. Are your rules enabling or limiting your team? Do you promote a culture of abundance or one of scarcity? The behavior organizations both encourage and discourage create a fertile ground. It’s hard to let go of the heroified version of being a leader. Our social narrative equals leaders with someone with superpowers. However, many of the most revered so-called leaders, have been anything but generous. Leadership requires courage and generosity, not a superpower. Great leaders make leadership fluid — they create more leaders, as Tom Peters said. Organizations need everyday heroism. You don’t need superpowers to lead. That’s a mistake. Stand up for what you believe. Don’t just speak up, do something. Be true to your values. Be brave to take ownership of your mistakes. Celebrate others’ accomplishments more than you would celebrate yours. Your role is critical — the mission demands you to be brave. Your life can be epic in every aspect, not just at work. You don’t need a superpower to become a hero. Heroism is the courage to say “I don’t know.” Lead with questions. Challenge people to find their answer rather than wanting to provide every solution. Challenge your beliefs. Challenge yourself. Every Day. You don’t need to wait for instructions. Give yourself permission to lead. You Need to Give Yourself Permission to Lead was originally published in Stretch for Change on Medium, where people are continuing the conversation by highlighting and responding to this story.